Who hasn’t dreamed of the ultimate treehouse? Who doesn’t love a quiet perch in which to hide away from the world and watch as it goes on below you? Who doesn’t love a treehouse? It’s something many kids dream of and create with lots of scrap wood and imagination. But not many kids, and far fewer adults, jump into a treehouse project with the determination of Lukasz Kos and his client. While in his first year of architecture school at the University of Toronto Kos entered a contest initiated by the property owner. The owner wanted a treehouse design with at least two levels, one of them enclosed. The house was to be at least 26 feet off the ground and no more than 36. Out of the 40 entries, a jury consisting of university professors and the homeowner’s wife chose Kos’ design. 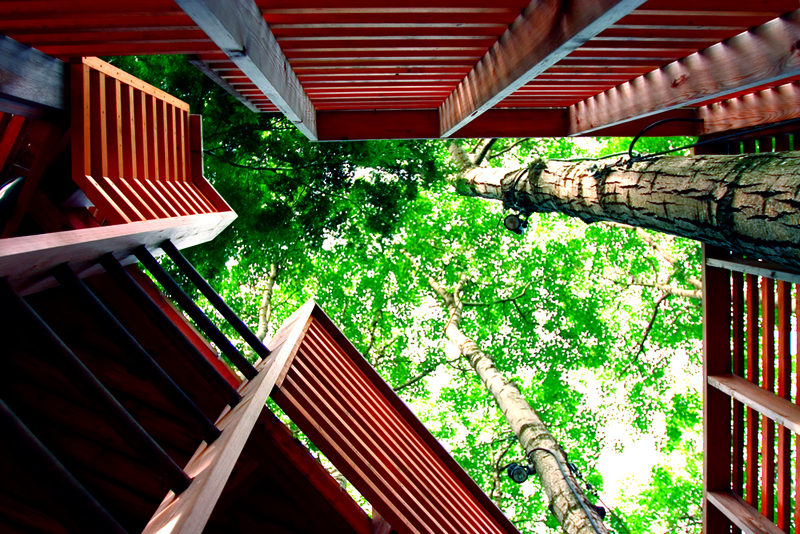 Now known as the 4Treehouse, the project cost $50,000 and took three-and-a-half months to build. With horizontal clear pine slats, the first floor of the 410-square-foot building is enclosed, lined with Douglas fir. Four large poplars act as columns to support the structure and are wrapped within the structural skin of the project. In order to maintain the trees’ health and growth, Kos designed the building to have minimal impact on them. Using a traditional Muskoka balloon frame was the solution. One high-strength steel cable was attached to each of the four trees. From these single attachments, the four steel cables suspended two Douglas fir beams (one for each pair of cables), literally creating two giant swings on which the frame sits. When the wind blows, the structure sways in the breeze. 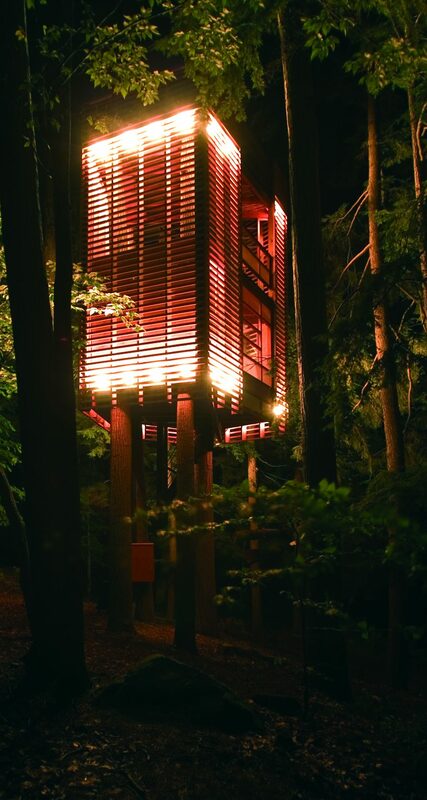 The lattice-like skin of the structure acts like a tree canopy, filtering sunlight into the interior spaces while at night the surface of the treehouse looks like a lantern suspended in the forest.